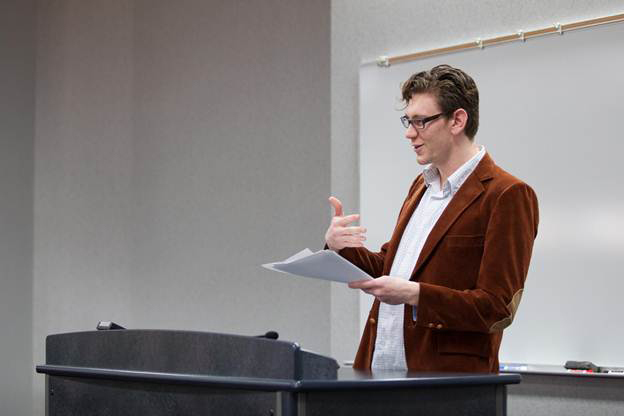 Grace College graduate student Trent Crofts presents “A Theological Discourse on Biblical Priesthood” at the annual symposium, Communitas. An estimated 100 Grace students attended the third annual Communitas, a symposium hosted by the Office of Faith, Learning and Scholarship, which was held on Wednesday, March 20, at the Orthopaedic Capital Center. The symposium, an event designed to showcase student creativity and research, gives students experience in presenting their work in a professional atmosphere, and provides opportunities to explore the integration of faith and learning. This year’s event included 26 presentations from a variety of disciplines and majors, an art showing in Mount Memorial Gallery, and a special presentation by Remnant, Grace’s traveling theater group. Students could choose from a variety of topics and attend sessions with several related presentations. Session topics included Critical Issues in Apologetics and Theology; Explorations in Social History; Studies in Water Quality and the Local Environment; Language, Culture, and Relational Dynamics; Beating the Odds: Mathematics and Gaming Strategies; Myth, Language, and Custom as Cultural Markers; Perspectives on the Intersection of Politics and Society; and Original Works of Fiction. Presentation titles included ‘The Exodus and the Myth of Ancient Israel’ by English major Joy Martin, ‘The Long-lasting Effects of Communism: Child Welfare in Post-Communist Romania’ by Special Education major Nina Ferry, and ‘Perceptions and Perspectives of Latin American Culture’ by Languages major Will Gross. To see the full program as well as learn more about student scholarship at Grace, visit the Office of Faith, Learning, and Scholarship’s Student Scholarship page.